MANN, James Robert, a Representative from Illinois; born near Bloomington, McLean County, Ill., on October 20, 1856; attended the public schools; was graduated from the University of Illinois at Urbana in 1876 and from the Union College of Law, Chicago, Ill., in 1881; was admitted to the bar in 1881 and commenced practice at Chicago, Ill.; member of the Oakland Board of Education in Chicago in 1887; attorney for Hyde Park and the South Park commissioners of Chicago; master in chancery of the superior court of Cook County; member of the city council of Chicago 1892-1896; chairman of the Illinois State Republican convention in 1894 and chairman of the Republican county conventions at Chicago in 1895 and 1902; elected as a Republican to the Fifty-fifth and to the thirteen succeeding Congresses and served from March 4, 1897, until his death before the close of the Sixty-seventh Congress; chairman, Committee on Elections No. 1 (Fifty-eighth through Sixtieth Congresses), Committee on Interstate and Foreign Commerce (Sixty-first Congress), Committee on Woman Suffrage (Sixty-sixth Congress); minority leader (Sixty-second through Sixty-fifth Congresses); died in Washington, D.C., on November 30, 1922; interment in Oakwood Cemetery, Chicago, Ill.
Papers: 1887-1922. 39 containers. Newspaper clippings, correspondence, memorabilia, and printed matter relating to his political career. Ellis, L. Ethan. "James Robert Mann: Legislator Extraordinary." Journal of the Illinois State Historical Society 46 (Spring 1953): 28-44. Mann, James Robert. Contested-election case. Aldrich vs. Robbins. Washington: [Government Printing Office], 1900. ------. The Nicaragua Canal and the Hay-Pauncefote Treaty. Washington: [Government Printing Office], 1900. ------. Statement of Mr. Mann in the matter of the locomotive boiler inspection bills. [Washington: Government Printing Office, 1911]. ------. The war to free Cuba ... Remarks of Hon. 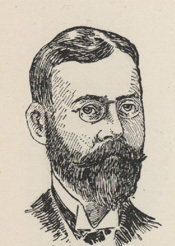 James R. Mann of Illinois, in the House of Representatives, March 8 and April 28, 1898. Washington: [Government Printing Office], 1898. United States. 67th Congress, 4th session, 1922-1923. House. James R. Mann. Washington: Government Printing Office,1924.